On Wednesday, December 20th, there will be a Public Information Meeting from 6:00-7:30pm at Bethany Evangelical Free Church. This meeting will be held to discuss the project known as “Winnebago St-Riverside Dr Diagonal Crossing“ and will be an opportunity for the public to provide input and ask questions regarding the project. On November 28th, this project was presented at the Pedestrian/Bicycle/Motor Vehicle Commission (you can watch that presentation here). The plan below gives a good idea of what is being proposed to improve the Capital City path crossing at Winnebago/Riverside. This plan was generally well received by commission members and should prove to be a significant improvement over the current crossing. One of the more significant benefits of this new alignment will be improved snow removal. The existing perpendicular crossing is very difficult for our snow removal equipment to navigate and large portions of the crossing often go unplowed. 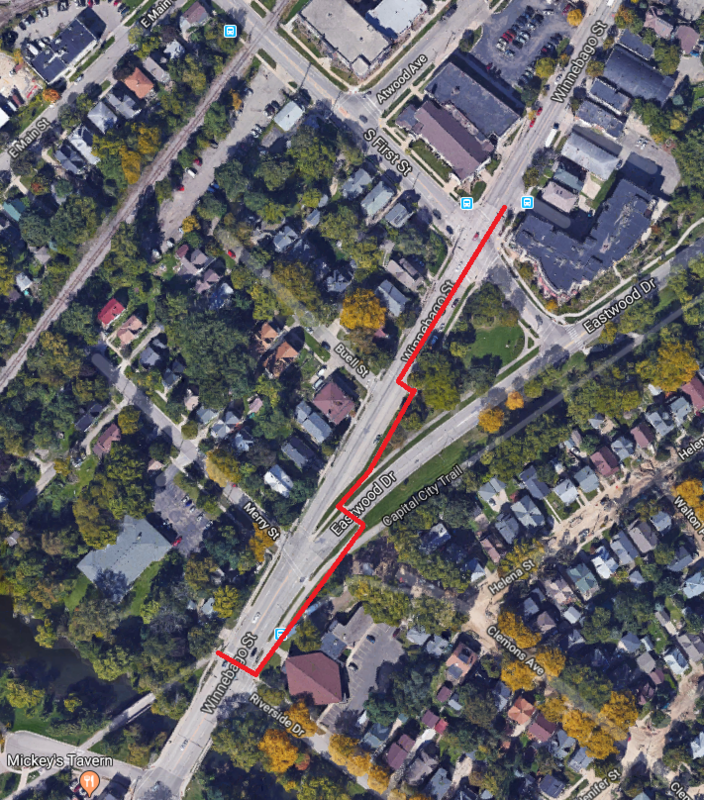 But what was not clear at the PBMVC meeting in November and what is not clear by the project title on Engineering’s website is that this project will also include replacement of the existing pavement from the north end of the Winnebago Street bridge over the Yahara River to the median at the intersection of Winnebago Street and Merry Street. This is very significant and the fact that it has not been more clearly articulated by city staff is cause for concern. It’s significant because this stretch represents one of the worst gaps in our bike network in this part of the city. As most neighbors that spend any amount of time on bikes will immediately recognize, this short section of right of way currently fails to accommodate eastbound travel by bicycle from the Capital City path to First/Winnebago and to areas further east--including the major commercial area at Schenk’s Corners/Atwood as well as the areas of development along Winnebago and Union Corners. There are currently three options to navigate this major connection by bike. The first two options both require crossing Winnebago/Eastwood twice, include several sharp, right angle (or worse) turns, and time spent riding on the sidewalk. This option reduces the crossing of Winnebago/Eastwood to only the inbound Winnebago lanes and has no sharp turns to navigate, but it does require riding on the narrow sidewalk between the Capital City path and Merry Street and also involves riding about 100’ in the wrong direction on Winnebago Street before picking up the eastbound travel lane. This 300’ gap (from the end of the Capital City path to the beginning of the eastbound travel lane on Winnebago) has been consistently identified as needing improvement by community members over the years. It has been called out at in 2007, 2010, and 2016 as part of the PBMVC public hearings for Pedestrian/Bicycle improvement projects; during the city sponsored 2014 Ideascale Ped/Bike idea solicitation; as well as during numerous map and dot exercises over the years, including for the recently approved Madison in Motion plan. And so the fact that this key connection is conspicuously missing from this major reconstruction project causes real concern that city Engineering staff may not have been tracking on this at all. Following the PBMVC meeting in November, and once it became clear that this project did indeed include the reconstruction of the roadway between the river and Merry Street, I sent these observations to our Engineering Department and asked that they work to address this missing link and to update the project plan to include a safe, comfortable, and direct connection for people on bikes that also ensures comfortable access for people walking and wheeling through this constrained and heavily travelled right of way. I also acknowledged the challenge in doing so, given the grade and retaining wall on the west side and the inability to exercise our powers of condemnation for bike and walkways recently passed by our state legislature. But as challenging as it may be, it would be unacceptable to continue to accommodate four-lanes of motor vehicle traffic while people outside of cars--those moving on foot and on bike and in wheelchairs--fight over the scraps that are left over once peak hour car traffic demand has been satisfied. In that same sustainable master transportation plan (Madison in Motion), we have committed to a future that increasingly prioritizes transit, biking, and walking over individual motor vehicle travel. And this is exactly the kind of project where, as a community, we will need to follow through with that commitment by allocating the space needed to promote and encourage active transportation. I’m hopeful that Engineering staff will come prepared to the 12/20 meeting with a new alternative that addresses this in a meaningful way and I’m resolved to work towards ensuring that it’s addressed if that isn’t the case. Please join the meeting in person if you can and stay tuned for more updates on this important project.